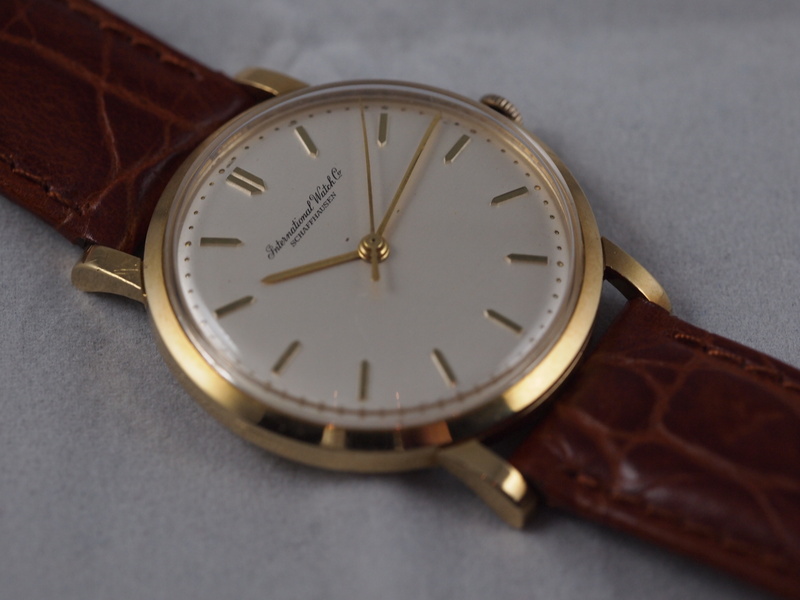 The best vintage watches are the ones that come with great stories. 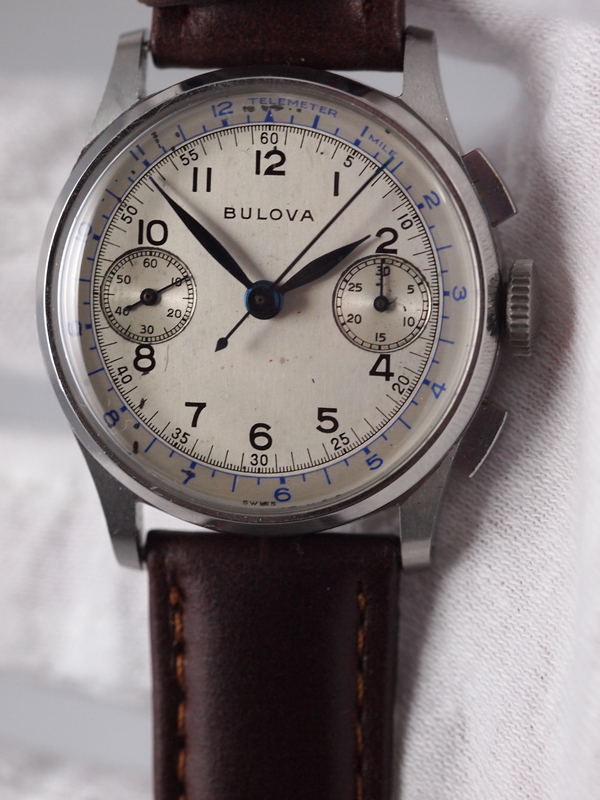 If not to inspire technically, a great backstory can make an otherwise normal watch into a fantastic collector’s piece. The limited editions, or the special releases that can start a conversation or conjure up a sense of adventure on the wrist are the ones I really seek out. As always, the best ones are worth waiting for, and so when this all original Kon-Tiki popped up I almost had no choice but to take it. 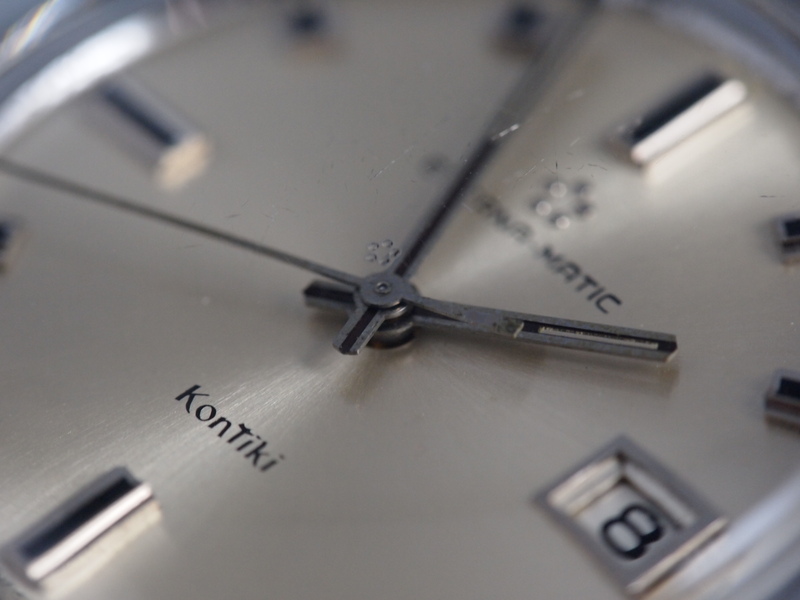 Originally introduced in 1952, the Kon-Tiki line was made to commemorate Norwegian explorer Thor Heyerdahl’s epic 101-day journey in a balsa wood raft to empirically show the possibility of contact between South America and Polynesia as early as 500 AD. While the merits of his journey and his discovery remain somewhat controversial, it does not change the fact that a guy with a bad historical record with water (he almost drowned twice as a child), made a crude ship and sailed 4,948 miles in it from Peru to French Polynesia. He had the courage to risk his own life to prove his hypothesis. 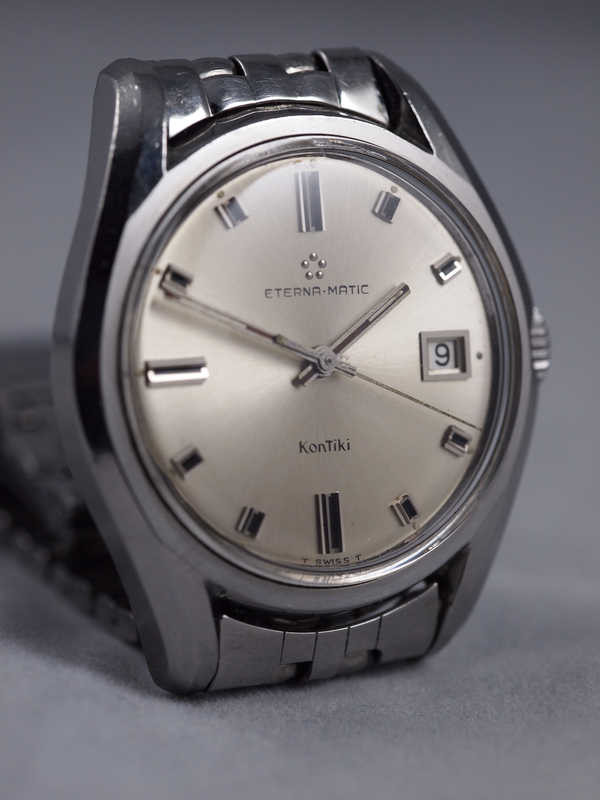 That he did all this wearing an Eterna watch was the genesis for the Kon-Tiki line. To this day it remains the most iconic Eterna series ever made. 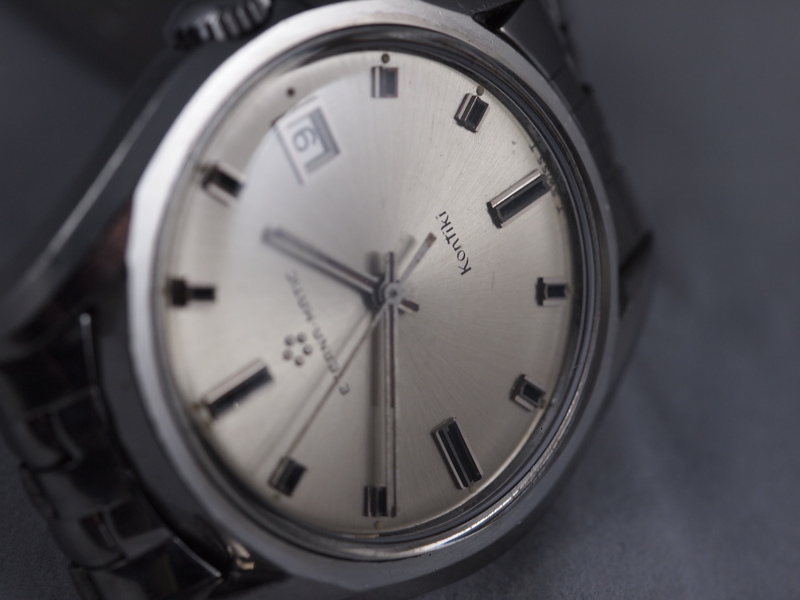 This particular line, like some older Omega constellations and Longines pieces comes with a raised design in the case back that goes a long way to tell about the historical condition of the watch. One careless polishing job and the design is irreparably damaged. Constant wear also takes its toll. 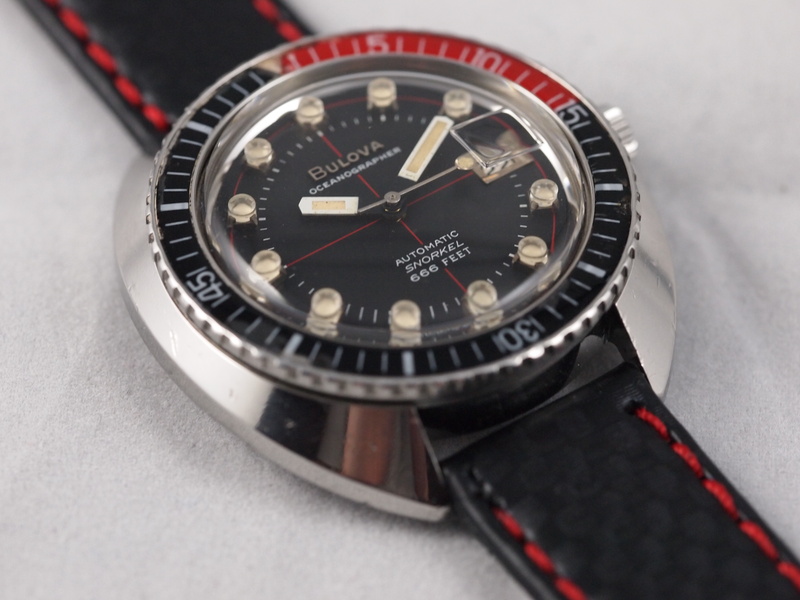 As a result it is very rare to find these watches with a perfect raised raft with the five Eterna dots on it. More than that there are tiny little wave lines that also flatten with wear. Also, like vintage omegas, the crystals are marked in the center. I had the good fortune to find this entirely original Kon-Tiki. The downside was that it was not working. That was changed, and after a thorough service it is running perfectly. The movement itself is impeccable. There is absolutely no rotor wear and no scratches. While this piece does have the scratches, nicks, and dings that most vintage pieces have, it fully maintains its all-original character and shows its age gracefully. All the hallmarks of a well-kept watch are there. 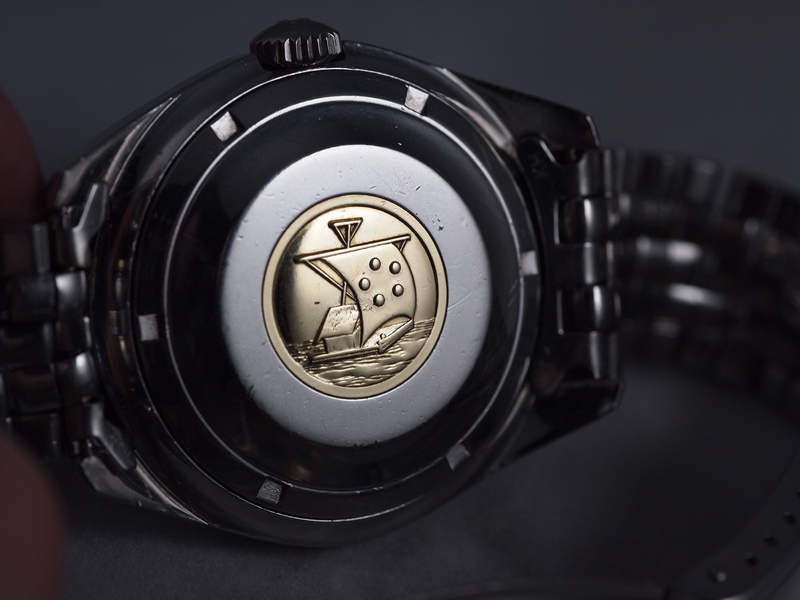 It has a near perfect dial, the original crystal, and a near perfect ship on the case back. Running again it is a wonderfully preserved vintage piece commemorating an incredible journey. 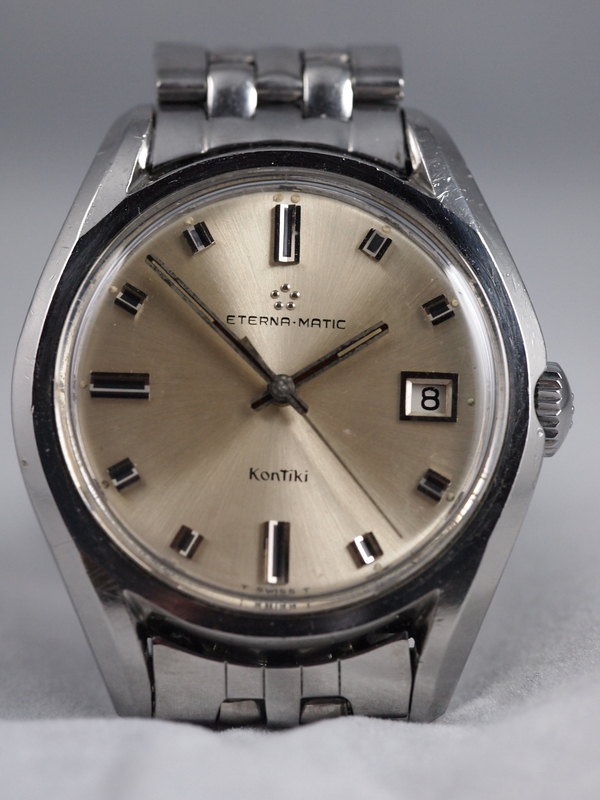 Eterna has a very long and turbulent history. They are an innovative company that has a very rough past. Currently in the hands of the Chinese group that also own Corum, Eterna continues to produce surprisingly innovative and interesting pieces that pay homage to their history but also showcase some technical sophistication that has always been a part of the Eterna DNA. If it is not yet clear that I have an affinity for odd watches, this most recent one will certainly solidify that sentiment. While working on such odd pieces does have one significant drawback (parts) they provide a unique restoration experience and I am always trying to look for my next one. 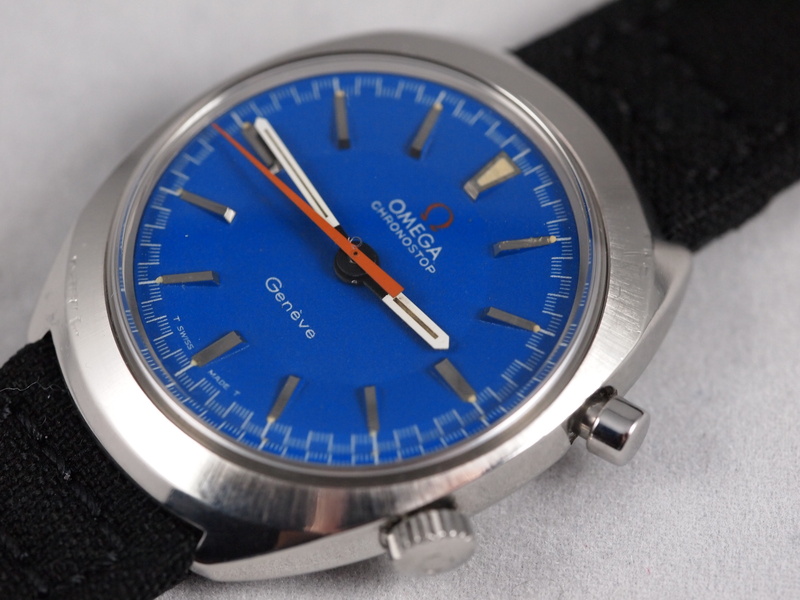 This Omega Chronostop was on my list for a while. 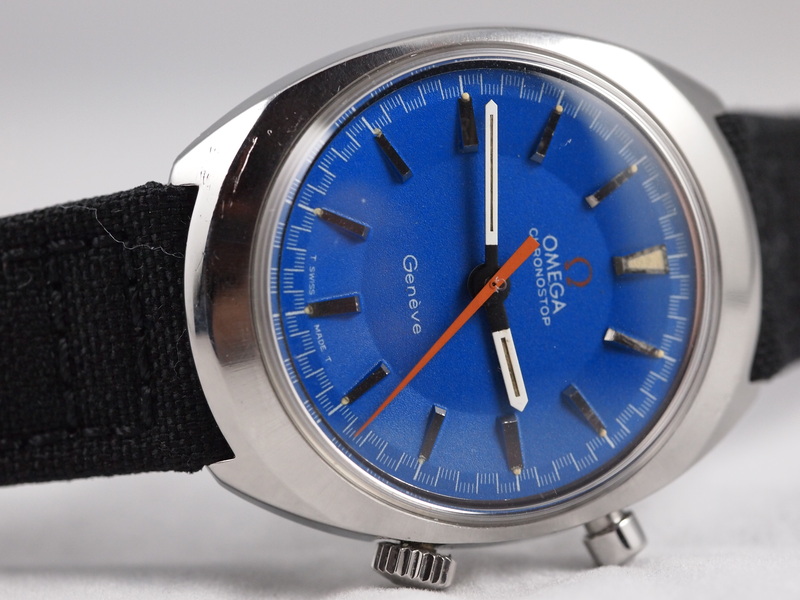 It’s not particularly expensive, but a one-minute register (one would have a hard time really calling this a chronograph) from Omega just seemed and looked so odd that I had to work on one. Starting in the late 60s it is estimated that about 124,000 of this caliber were made. It was a very short-lived production, the likes of which have never really been seen again. After a good search I found this great piece. 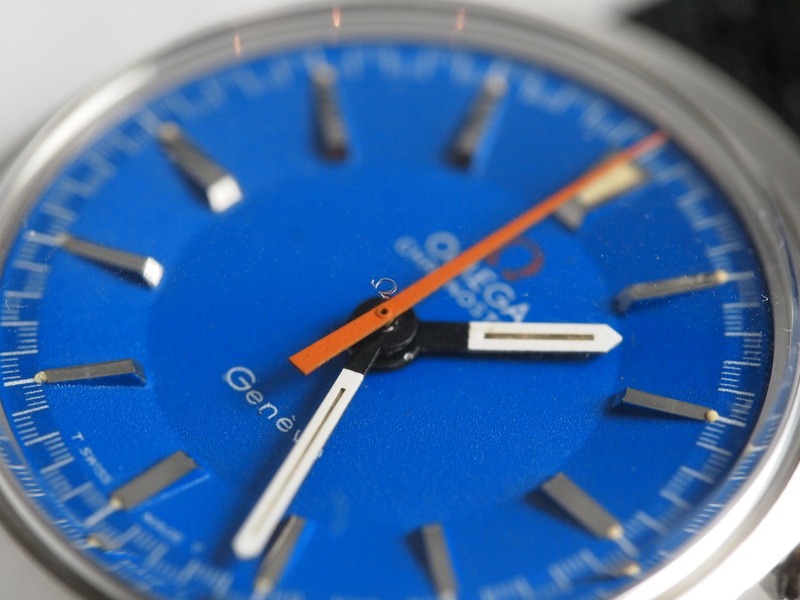 The near perfect blue dial is what brought me to it. 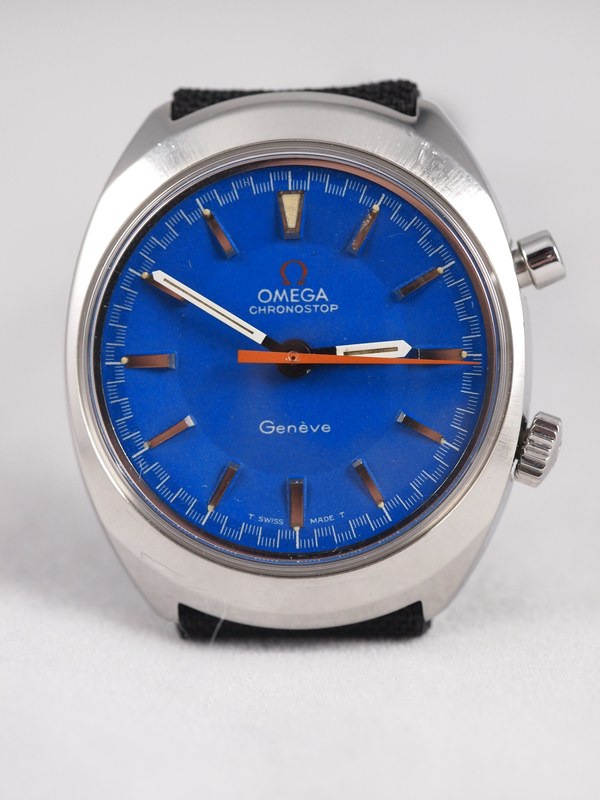 The deep blue color with and orange minute register against the stainless really makes this watch pop on the wrist. 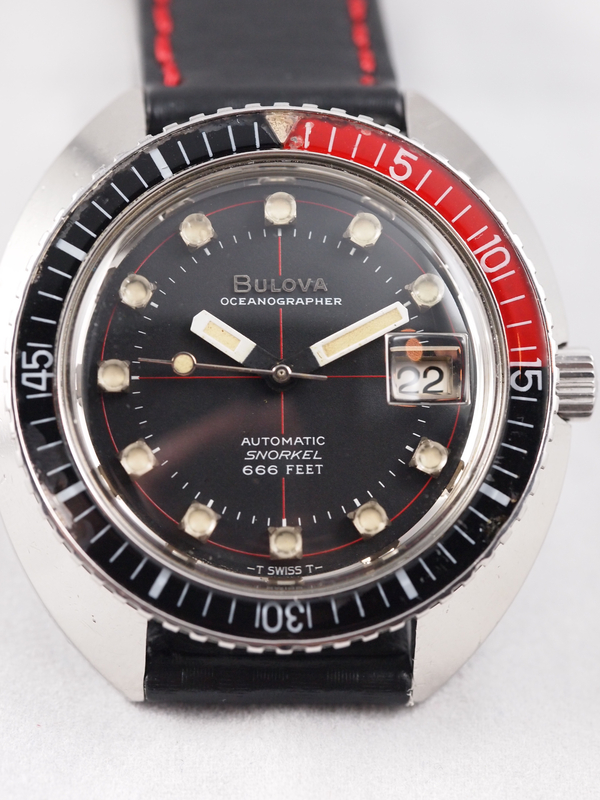 I knew immediately that there were a few things wrong but correctable on this watch. 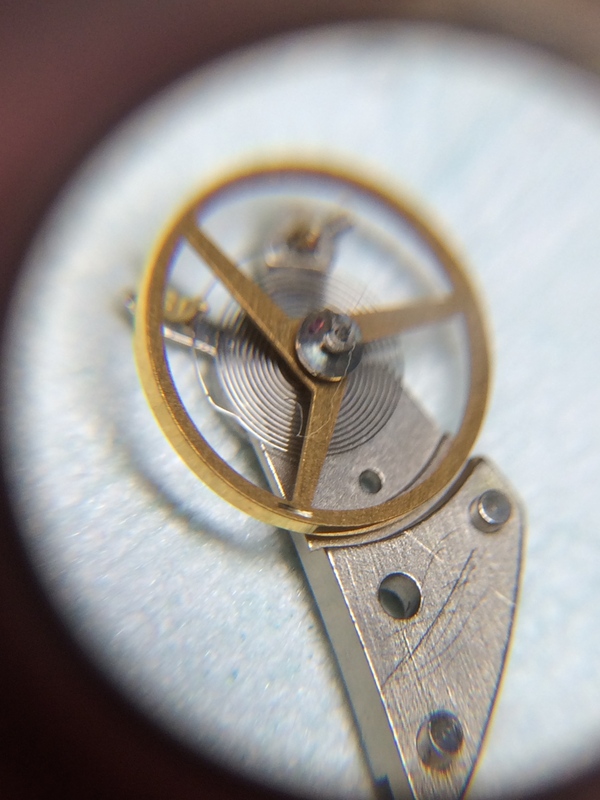 Firstly, the movement ring was wrong which caused the movement to move a bit in the case. Then there was the issue of the pusher. 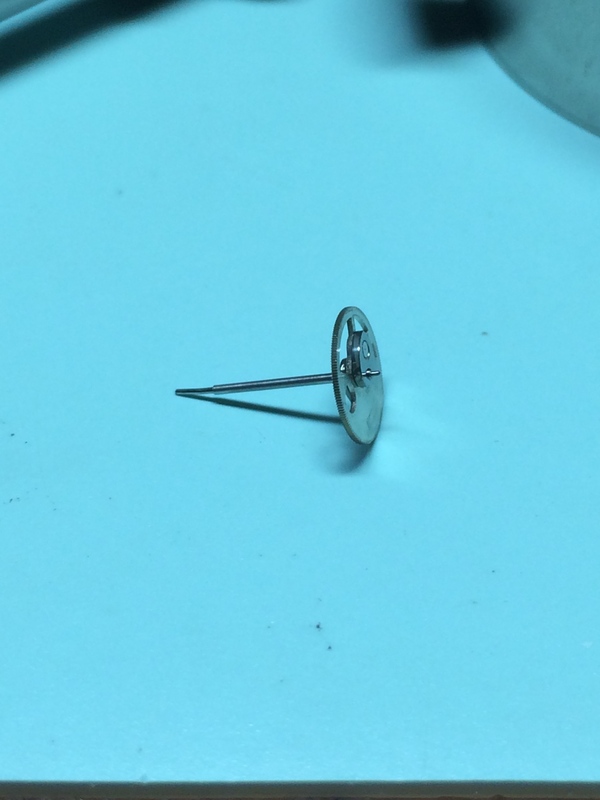 A prior watchmaker had substituted the plain button pusher for a women’s omega crown, which beyond looking awkward, functionally wasn’t perfect. And finally and not uncommonly, the crystal while original was scratched up. With these external parts ordered I got to the guts. This movement adapted a Lemania movement for a simple one-minute register. 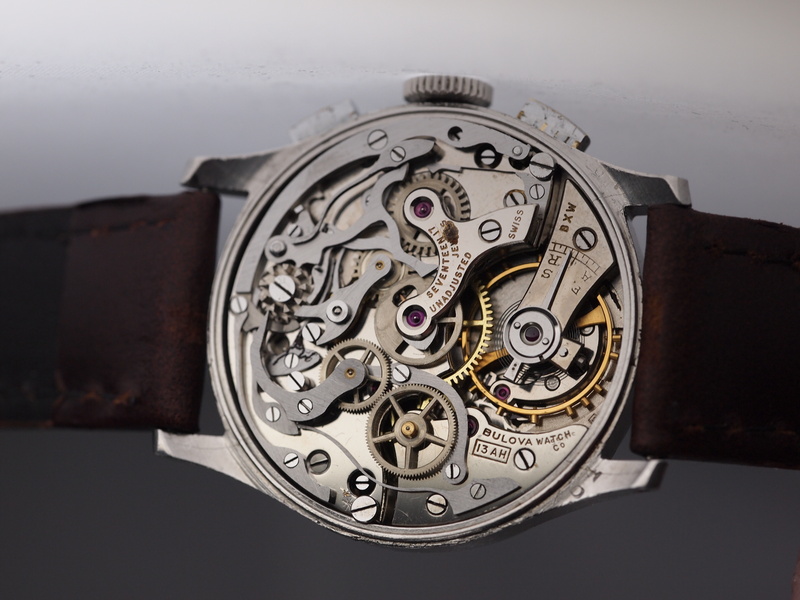 It is a great watch for anyone wanting to ease into the mechanics of the chronograph. The drastically simplified chrono-works make this a walk in the park compared to that Tissot Navigator I did a few months ago or a Valjoux 22, 23, 7750, etc. 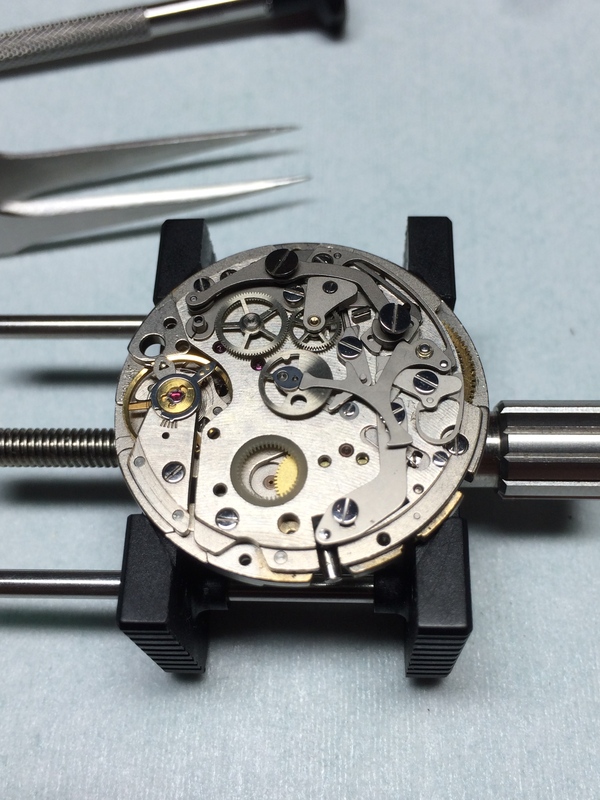 Once the movement was cleaned, inspected, and reassembled (and after I got past the always-mesmerizing color of vintage Omega movements), I set about getting the case right. The pusher issue turned out to be a bit worse than I had imagined. 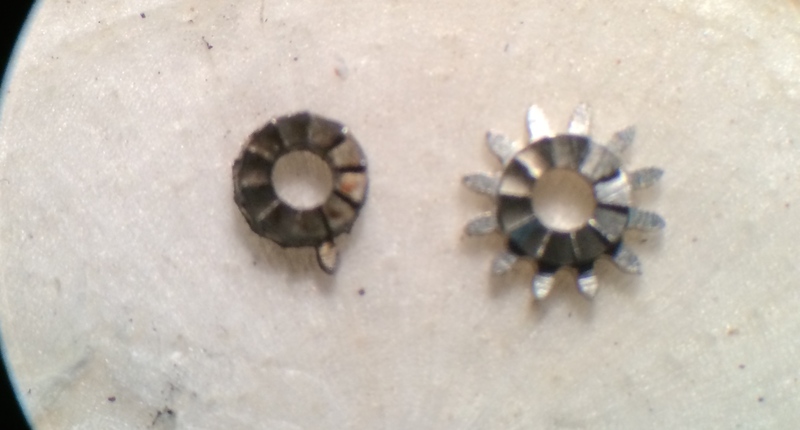 In addition to the crown, the tube was not right and was over-tightened into the hole in the case. Furthermore it was installed with an improper tool that left a scar on the case. This required a bit of elbow grease and a file to pry loose but once done, the brand new tube and pusher installed like a charm. After putting in a new genuine crystal I got the movement in with the new ring and it is back to its former glory. 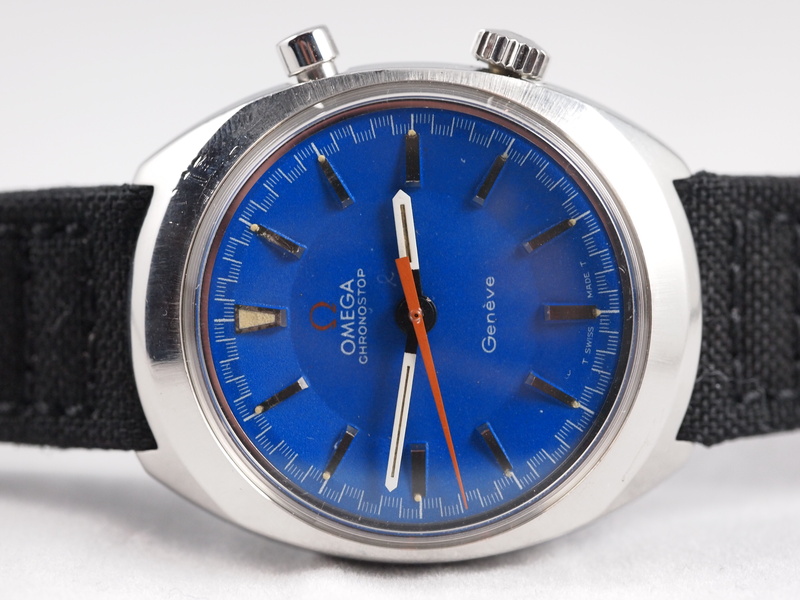 While one very much like this but with a date (but in less great cosmetic condition) sold for almost $1500 http://gearpatrol.com/2014/08/19/timekeeping-selects-omega-chronostop/ finding great examples at far less is most certainly achievable for anyone interested in owning such a great head-turning, and unique piece of Omega history. 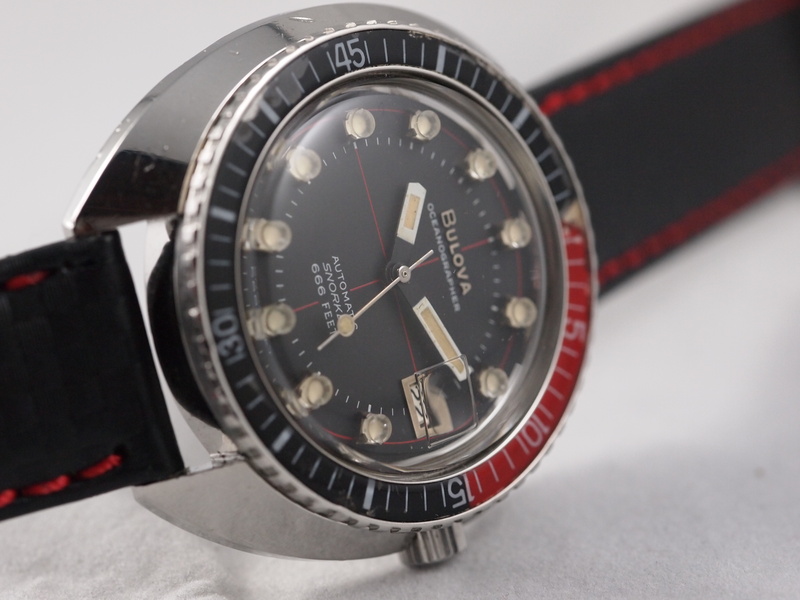 Over the years Bulova has managed to create a huge amount of iconic vintage models. 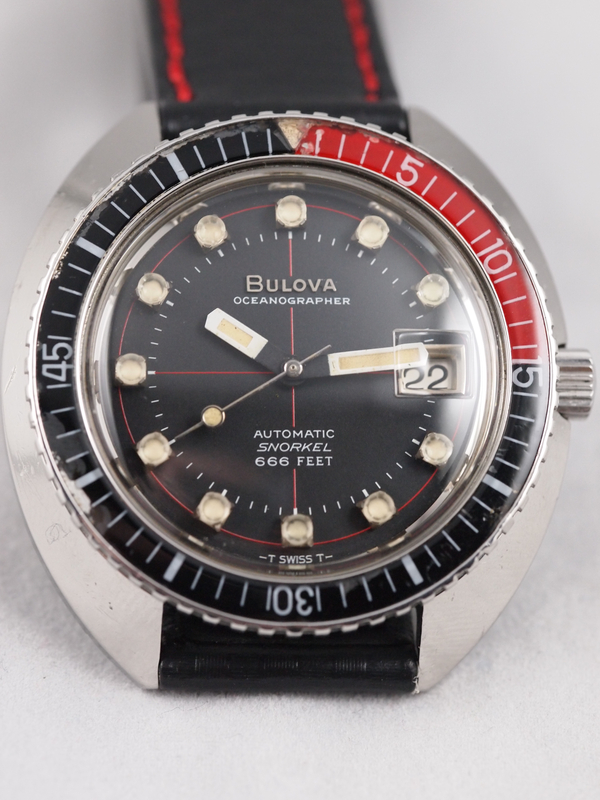 This Oceanographer Snorkel is one of my favorites, and took a long while to track a good one down. During my years searching I saw a decent amount of them go by. Some with wrong hands, hands without lume, hands that were re-lumed, unoriginal crowns, rusted movements, unoriginal movements, and just about everything else under the sun. Then this one came up. It was supposedly running well (see previous post for my thoughts on that claim) but that was less important than the fact that it was all original (except the crystal) and in phenomenal shape. 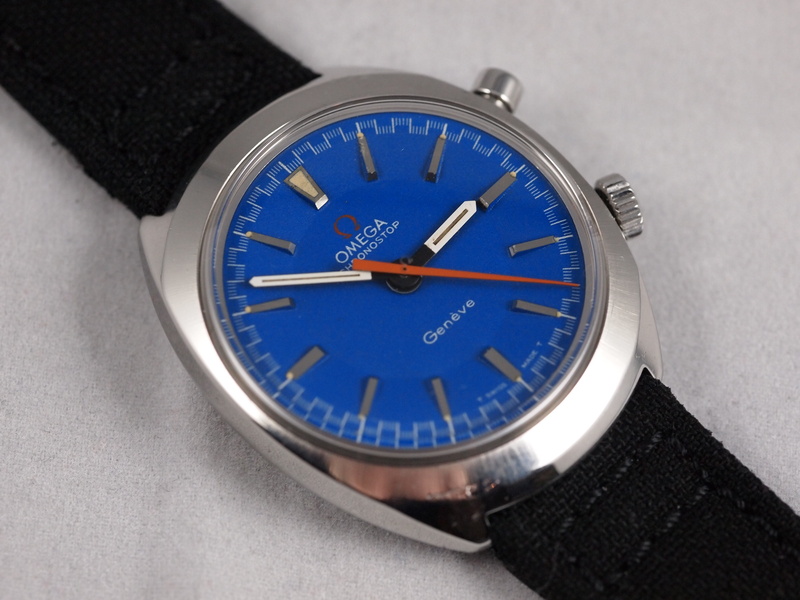 This watch is just so awesomely 70s. 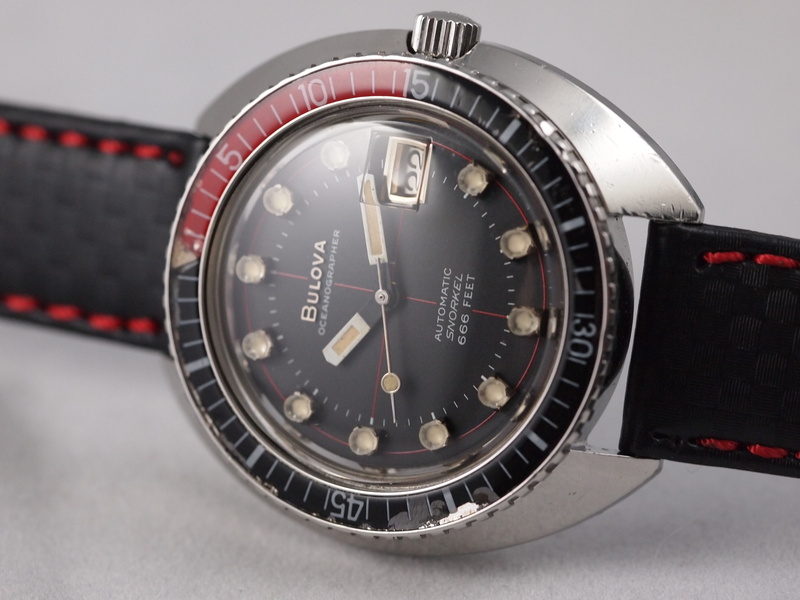 It’s very hard to imagine that Bulova was rolling out sleek Accutrons at the same time as this big automatic beauty. While the shape is stereotypically 70s, it is worth noting it was super early in the decade when this one rolled off the production line (1972) and this model was rolled out in 1969 making them one of the earliest trend-setters in the large 70s cases that followed. 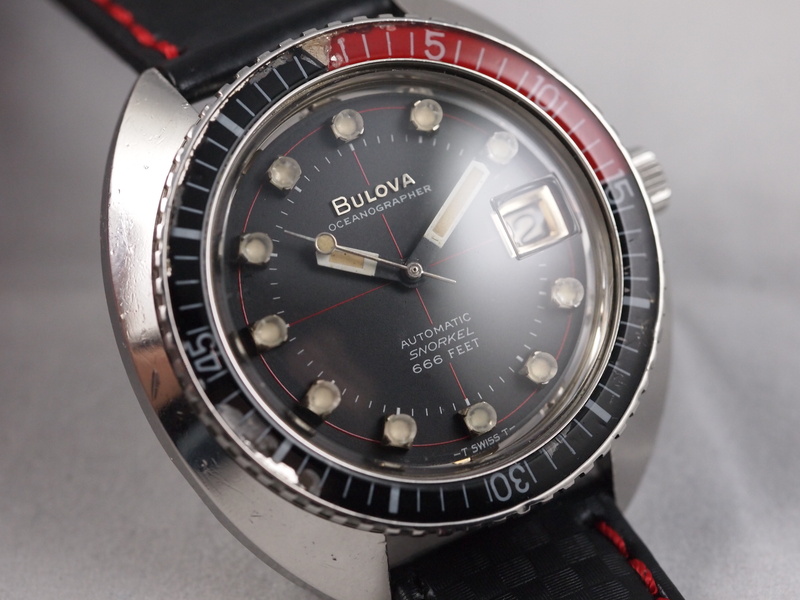 Usually watches have luminescent paint on the dials but Bulova did something I have never seen since which is an odd very raised luminescent pillar. 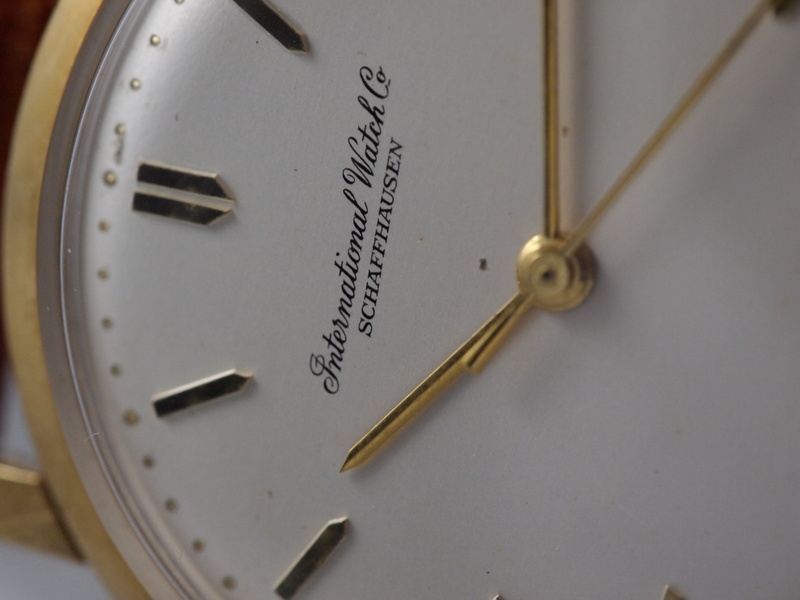 The combination of hand shapes is also unique and the sweeping circular second hand is perfect on it. 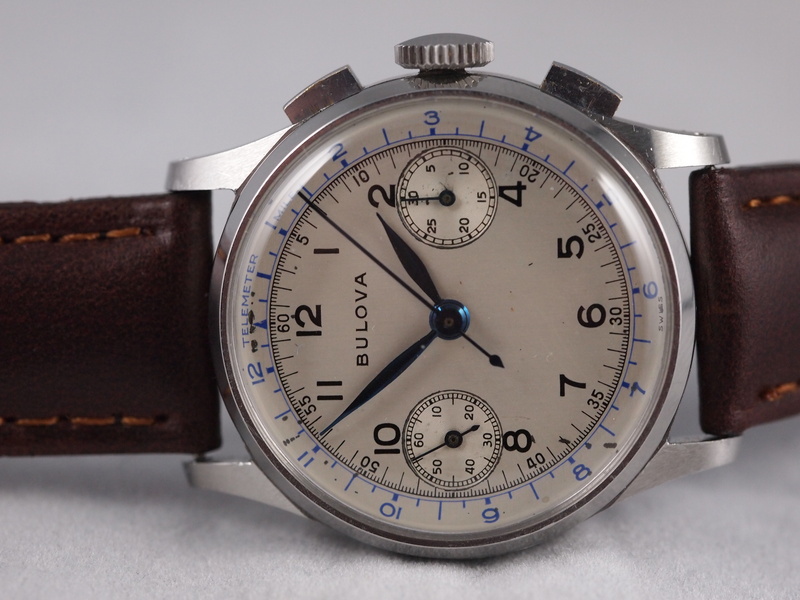 The combination of a bold, unique look, and a short production run time makes it one of the most sought after vintage Bulovas on the market. The watch itself ran for about a day after I got it. 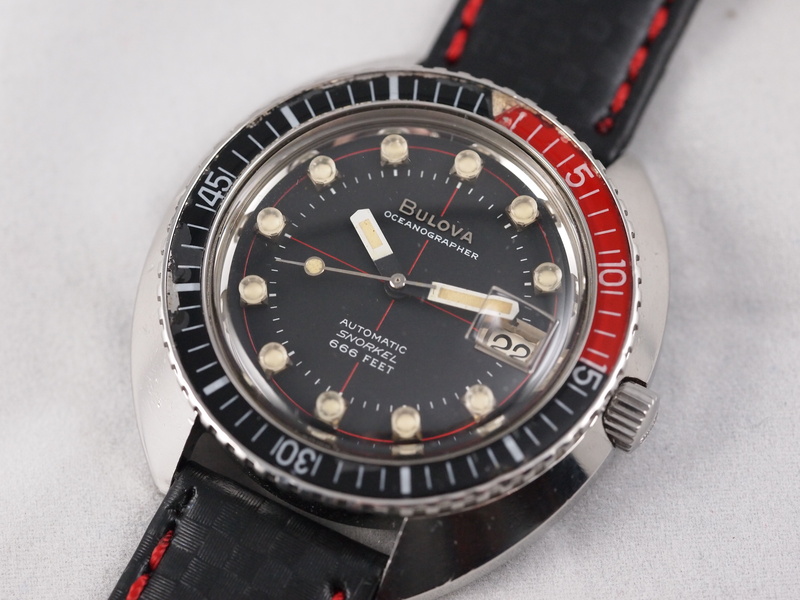 The unfortunate thing about Bulovas is that while parts are plentiful, and their movements can run for years, the failure rate is high, and they can prove to be very finicky pieces. 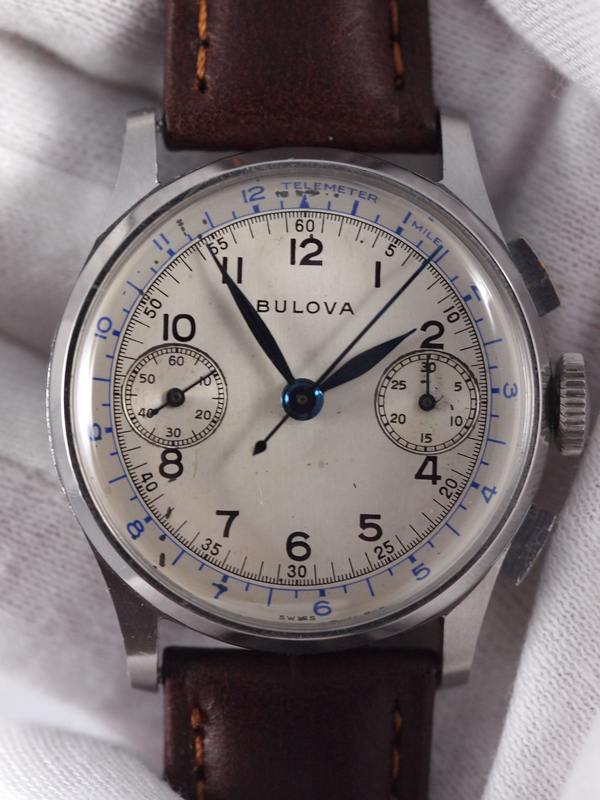 Any Bulova collector must be prepared to be patient with what may come their way. My caution with taking “serviced” or “running well” at face value is the following: those terms are really not specific enough to tell me anything meaningful if I don’t know who it is coming from. 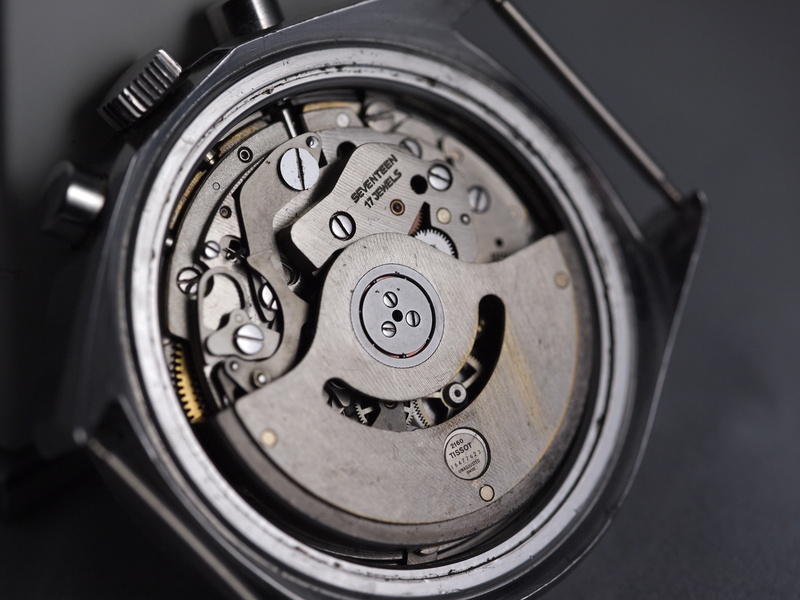 A service can mean it was fully disassembled, cleaned, lubricated, inspected, and tested. 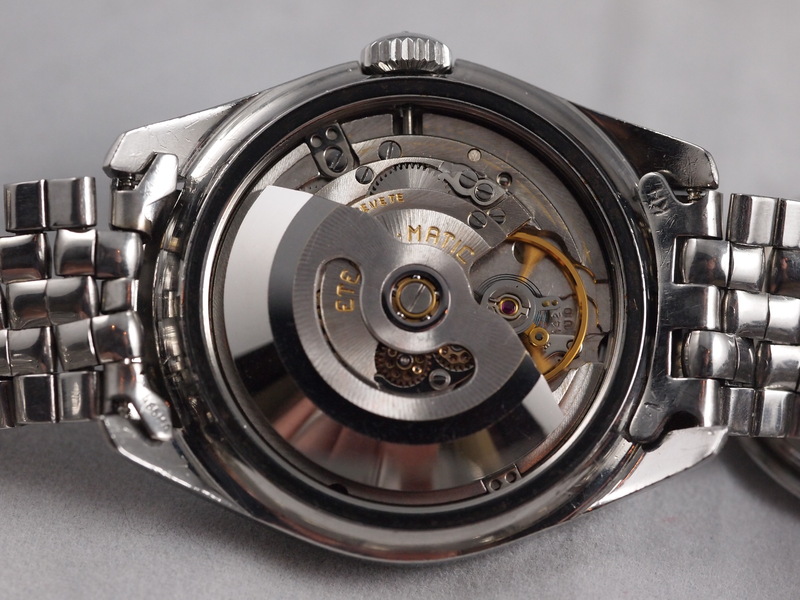 It can also mean a watchmaker looked it over said “it runs.” It can also mean that the movement was taken, placed in a cleaner, dried, re-lubricated and they called it a “service.” I’m not sure what this watch got before it came to me, but it certainly wasn’t the first scenario I listed. A cursory servicing does not help the issue as it does not indicate potential wheel failures or balance condition. 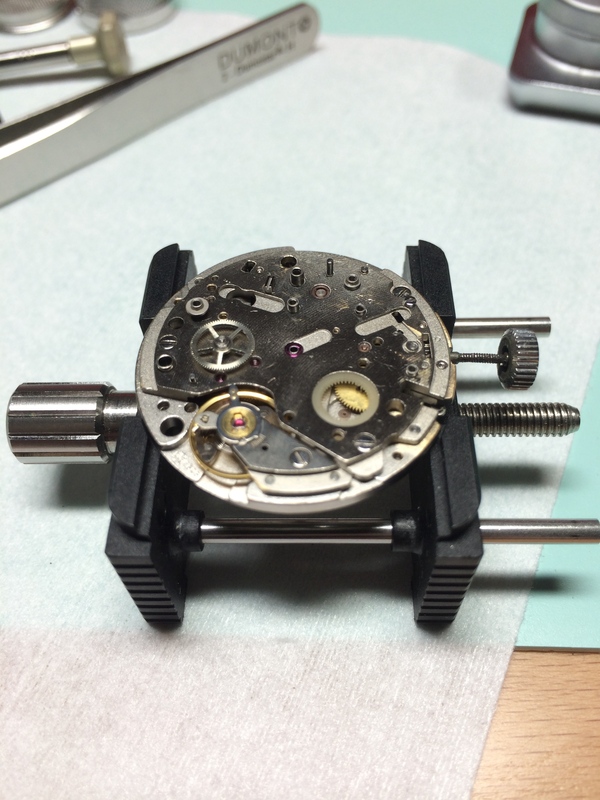 As a result it needed a real service, a new mainspring and balance, and it was running beautifully again. Mechanically it was running well, but there was just one problem. The crystal. These models came with a magnifier over the date and this piece arrived without one. 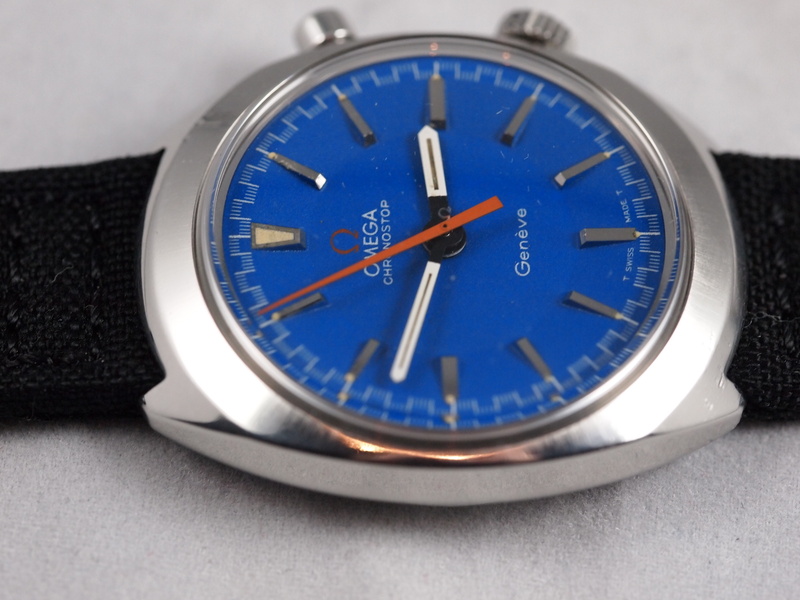 Fortunately I impulse buy rare bits for watches like this just in case I do one day need them. With the genuine original crystal installed I put the watch on a band whose color scheme I found appropriate. Before IWC was the avant-garde and aviation-inspired brand it is today, they made some uncharacteristically plain, but incredibly well executed ultra-thin and elegant calibers. Among those made were the Caliber 89, the 401, and the 402 to name a few. This 402 is so thin it almost disappears on its side. 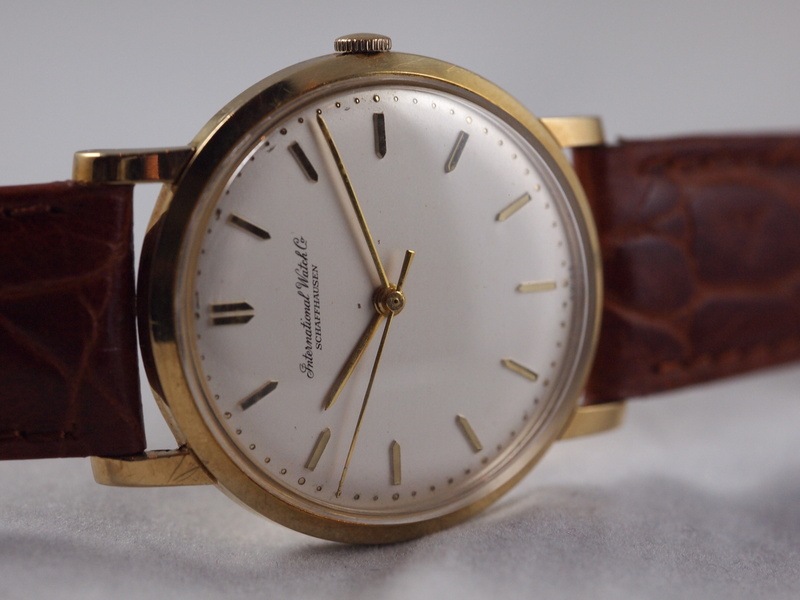 After spending a bit of time with this piece I am convinced that these vintage IWCs represent perhaps the best value for a solid gold, well-made dress watch on the market. I got this watch in “running but not tested” condition, which almost always means it is in need of service, not running well, and that there will be at least one goodie I’ll find inside. This was no exception. It ran nearly five minutes off per day. 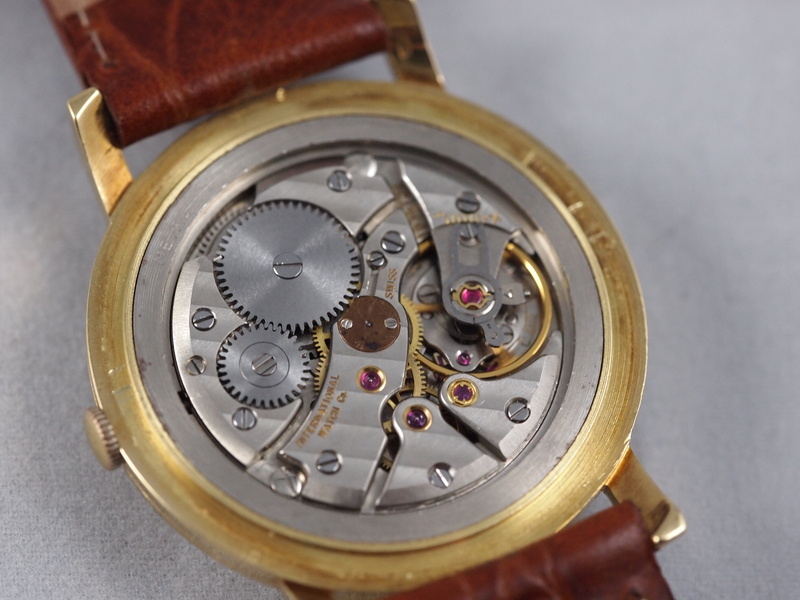 Additionally the movement of second hand was incredibly erratic and it would appear to “fall.” This is usually caused by the second hand being too loose for the pinion it rests on, but in this watch the problem was different. 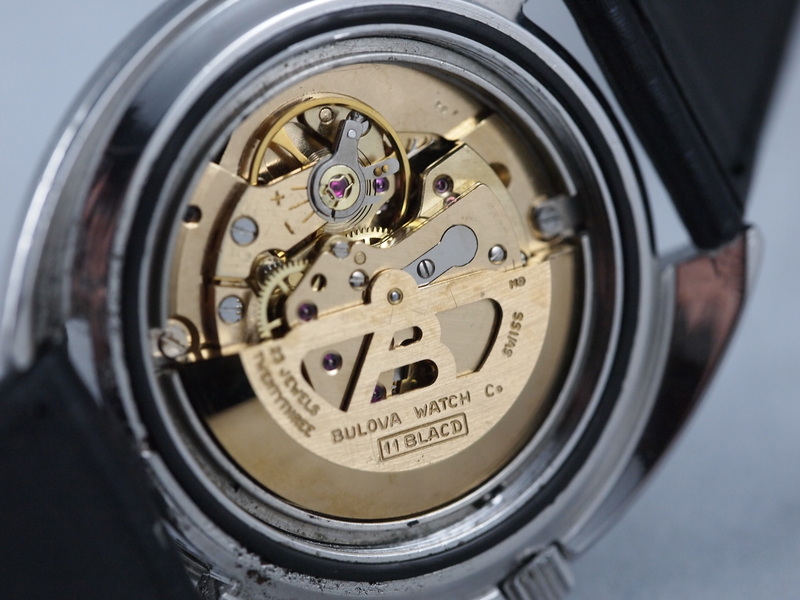 IWC employs a hair-thin friction spring to keep the second hand aligned and running properly. This piece is so fragile that it took me two attempts (and expensive parts) to get it done right. 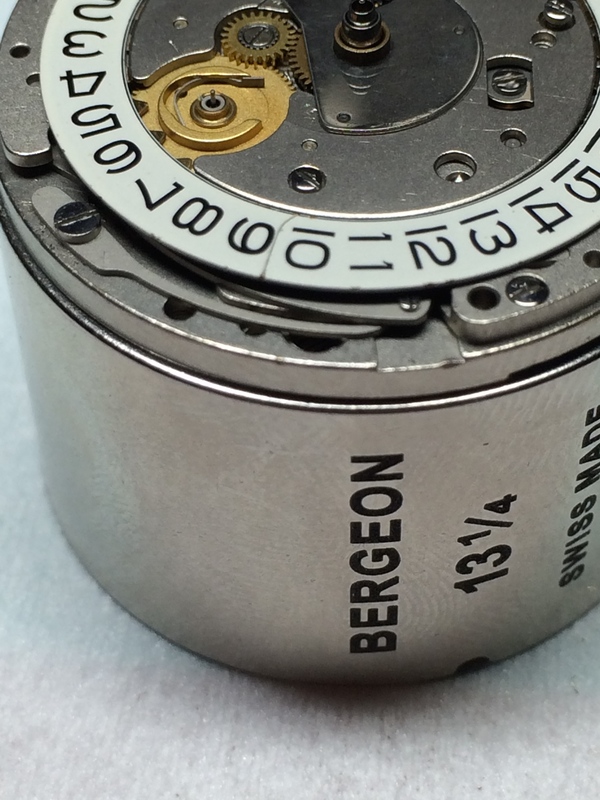 That part, a new mainspring, and a thorough cleaning and oiling got this beautiful dress watch up and running well again. On the wrist it is almost too light (even for solid gold!) 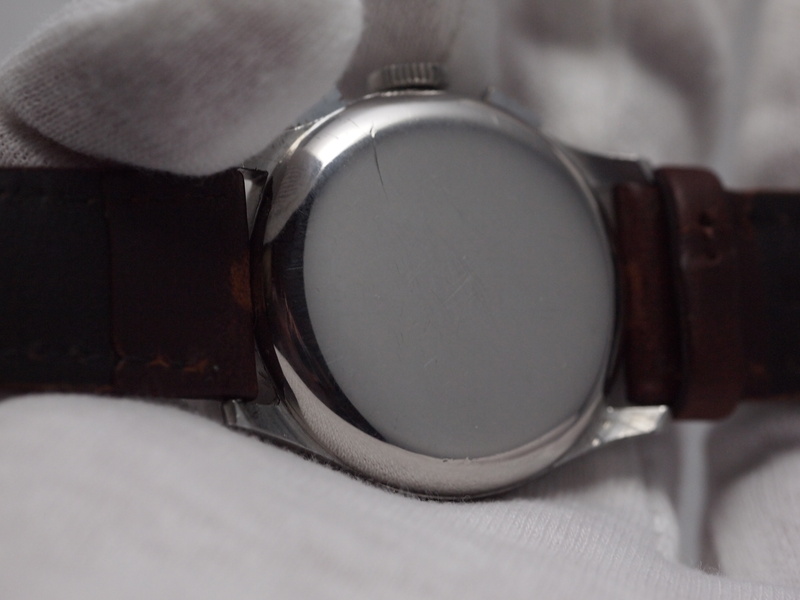 It is a perfect watch for people who do not like heft or a watch that doesn’t easily glide in and out of a shirtsleeve. It is without question a dress watch. I think someone would be very hard pressed to pull this off in jeans and a t-shirt. 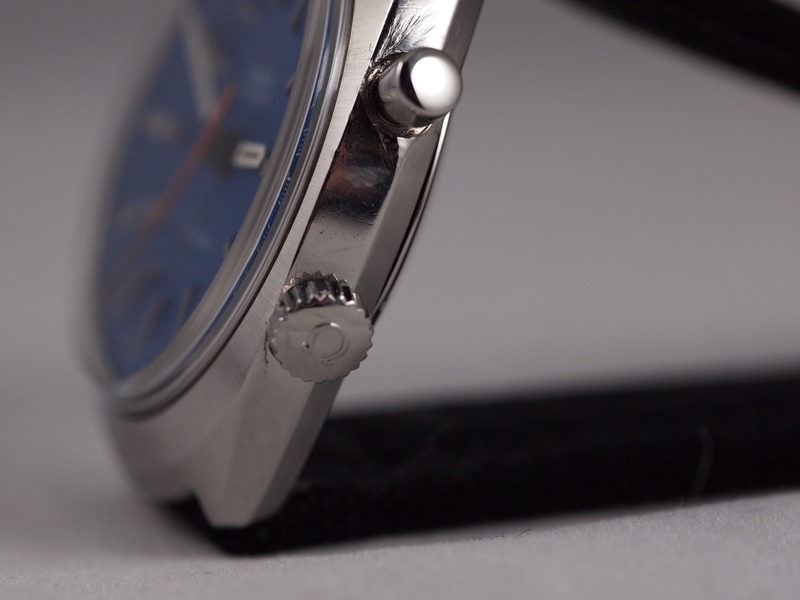 The dial speaks to the elegance of the overall piece. 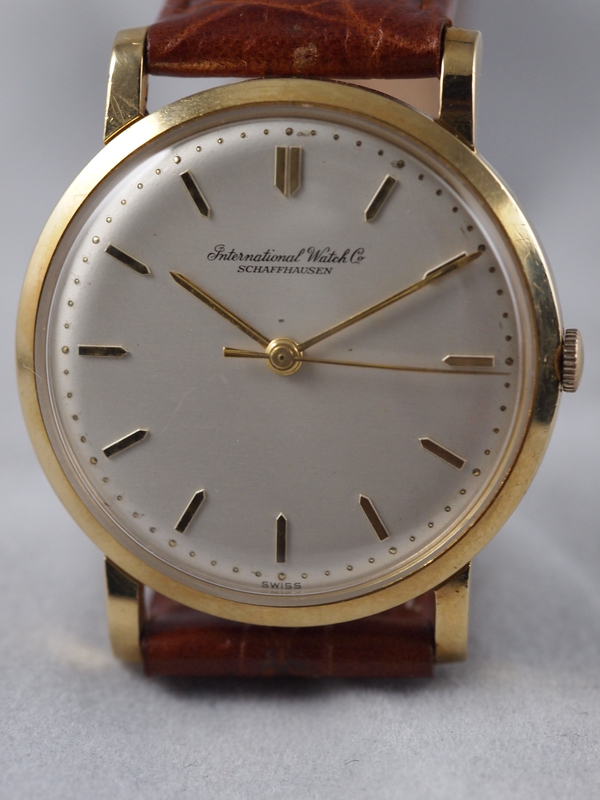 It is plain and simple yet the International Watch Co font gives this watch its tone. 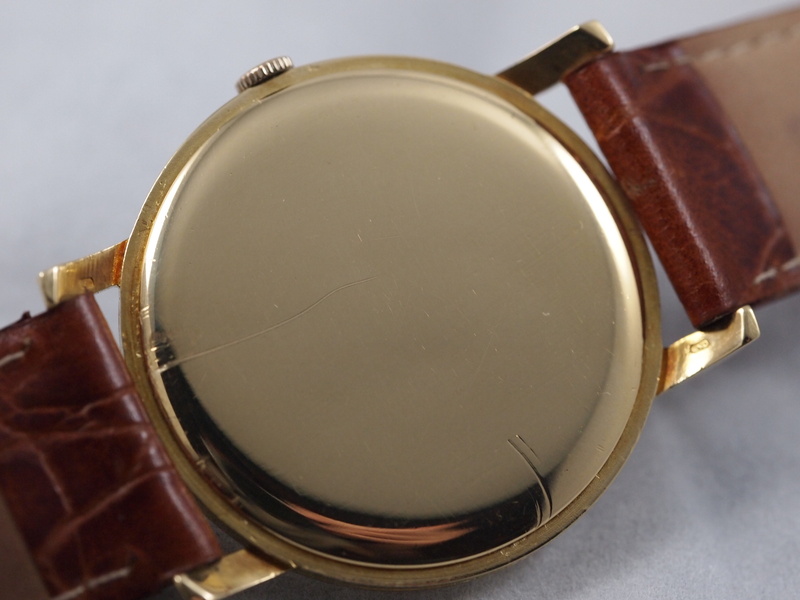 The only real external flaws on this watch are the unfortunate scratches someone gave it trying to open it. 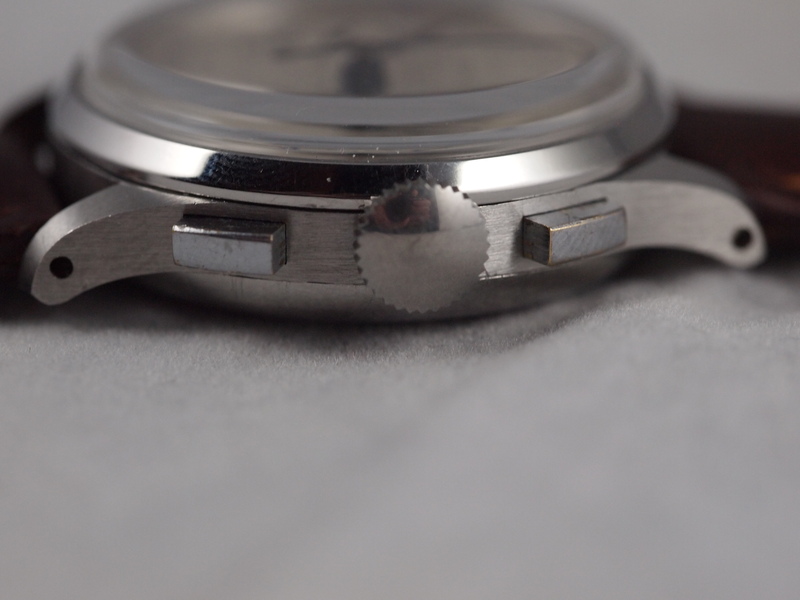 Watches like this tend to have a very small notch where the case opener has to be wedged. For this purpose I obtained a tool and spared no expense in doing so. It is a very small and very sharp lever that is capable of opening almost any snap off case without making a mark. The person before me was not as gentle, and clearly didn’t look for the ledge. The result was a scratch down the back. 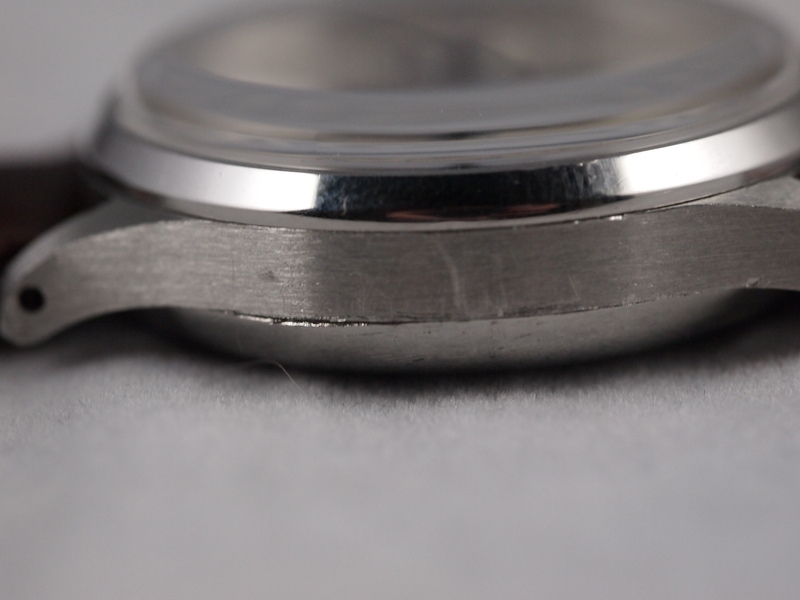 Then when they found the notch, it took a few tries, resulting in the smaller scratches that can be seen. 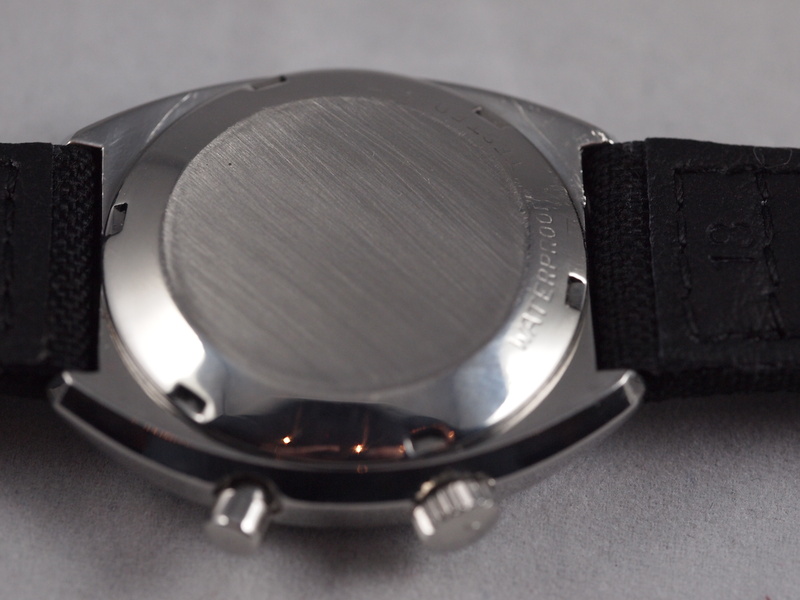 Fortunately they are on the back, and do very little to ruin the impression this piece gives on the wrist. Back together this is one of my favorite vintage dress watches that I have had the chance to work on. 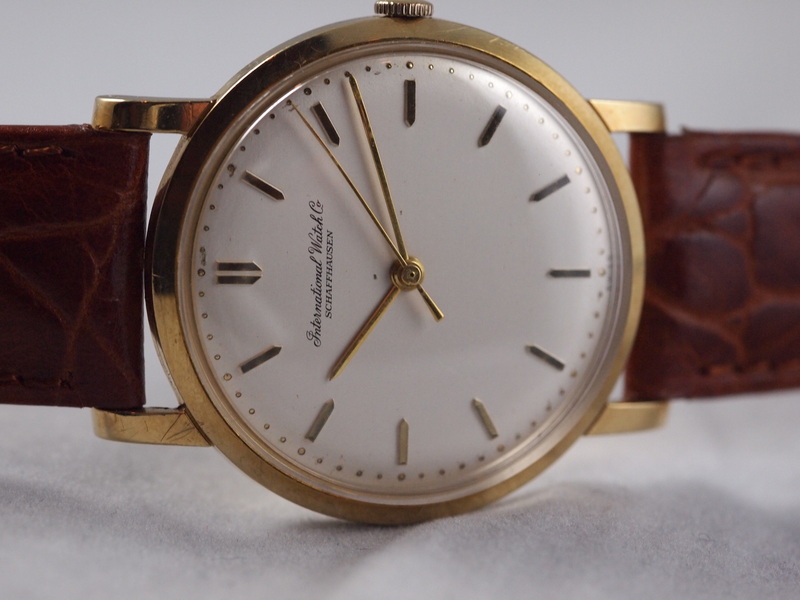 It has a remarkably well-made movement (albeit fragile) and its wafer thin construction makes it one of the most comfortable and unassuming solid gold pieces on can own. 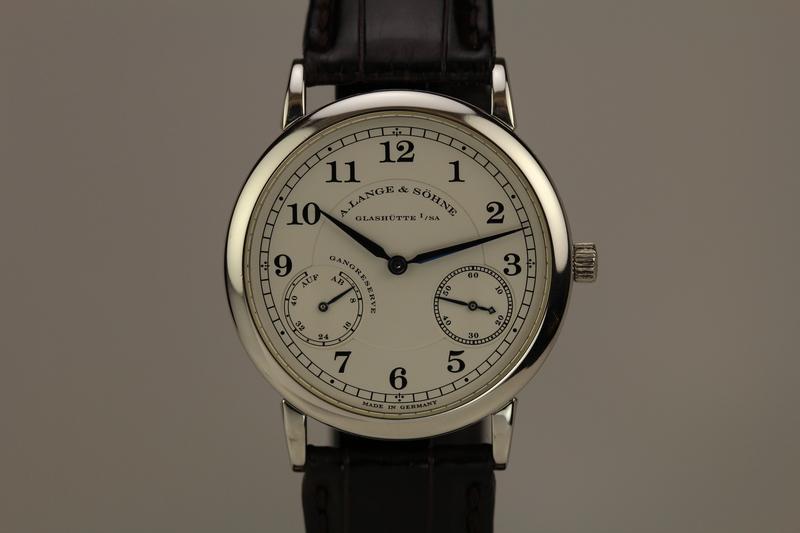 Next up on my IWC list is definitely a Caliber 89. 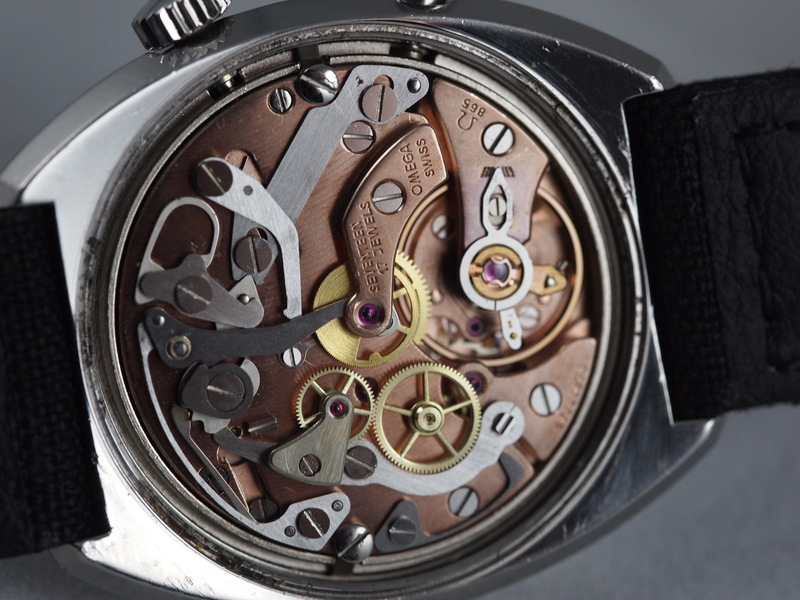 This great piece definitely changed my perceptions on IWC as a brand. 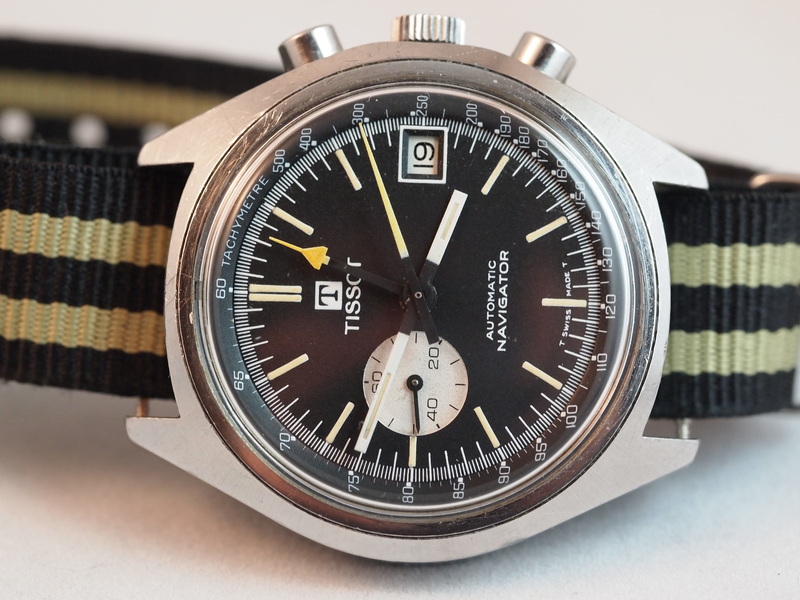 I recently had the good fortune to work on a rare Tissot Navigator Chronograph. There is not much to say about this watch. 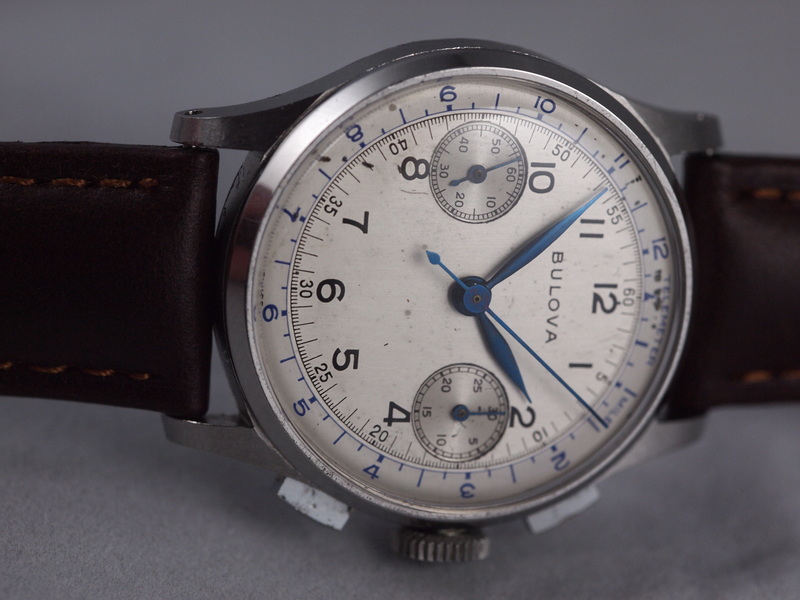 It’s a rare, really cool looking, and badass vintage chrono. 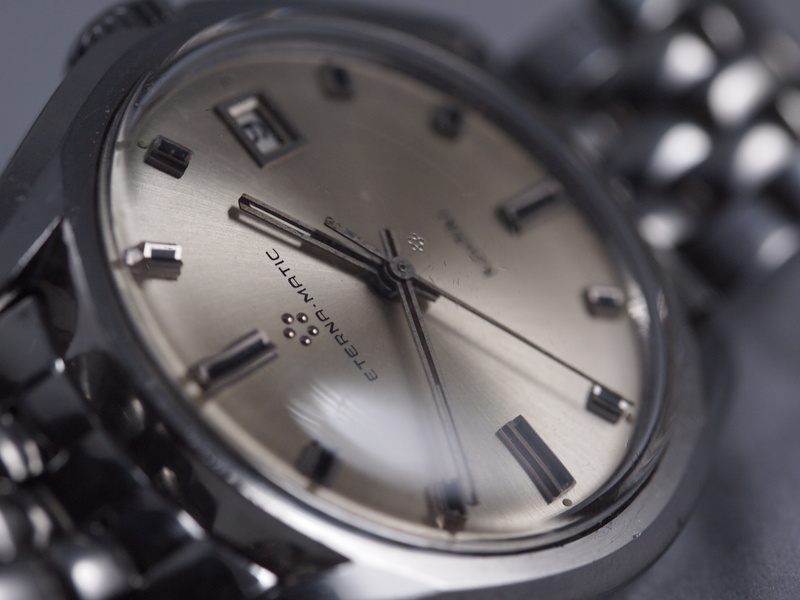 Inside it however was a dark past that serves as a stern warning to those wading into the vintage watch world. 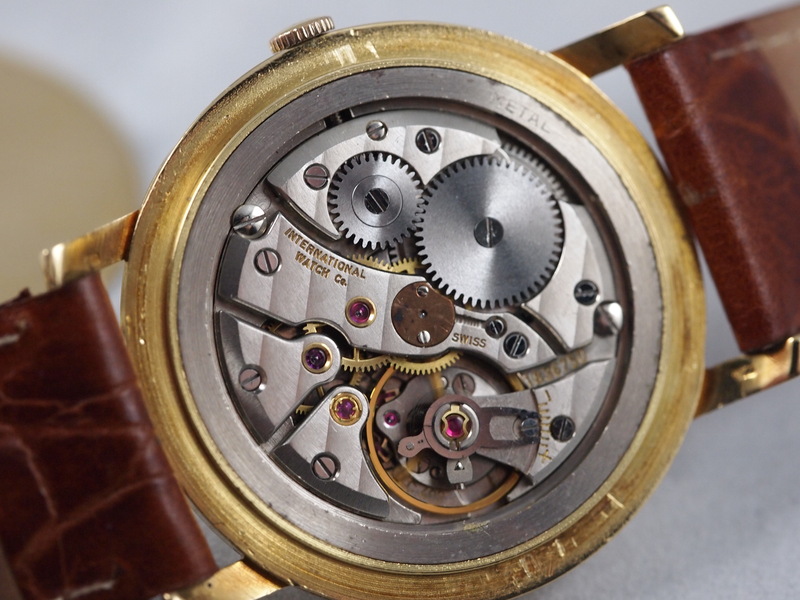 Pieces like this have been around long enough to have that eye-catching vintage appeal, but that also means they have been around long enough to visit a terrible or careless watchmaker or three. 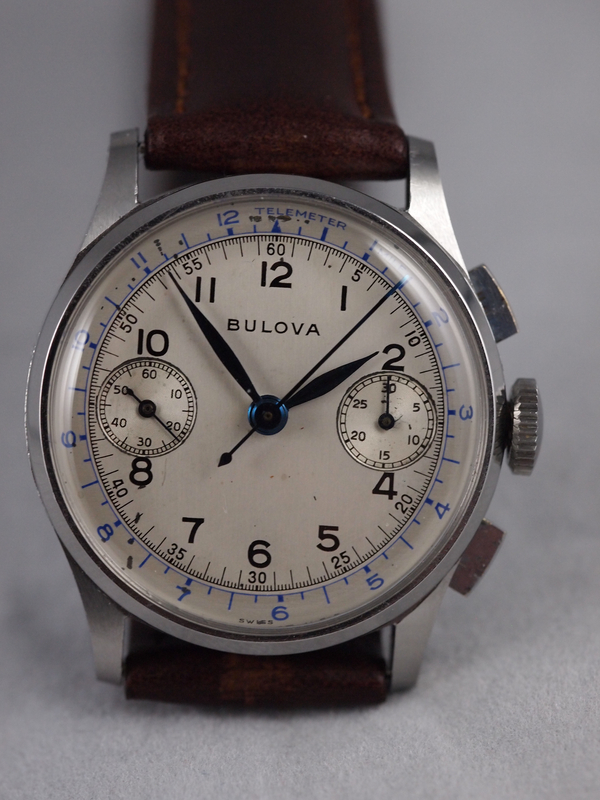 Vintage chronographs are always great challenges. In addition to providing a complication at a relatively low cost, the variety of chronographs out there makes them an endless source of fun. 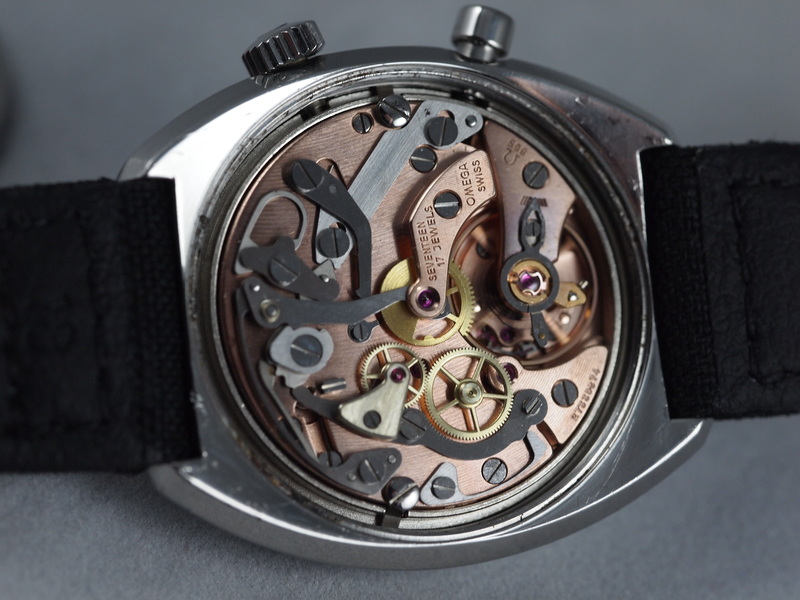 Equipped with a Lemania 1343 (most like an Omega 1010 minus the hour counter) this movement proved to be the great balance of enjoyable, educational, frustrating, and infuriating that keeps me from ever getting bored with watchmaking. The movement itself was a pretty challenging assembly. The gear train bridge is enormous. It is almost as big as the main plate because it combines the normal train bridge with the barrel bridge and puts several additional gears under it such as some that are necessary for the rotor. 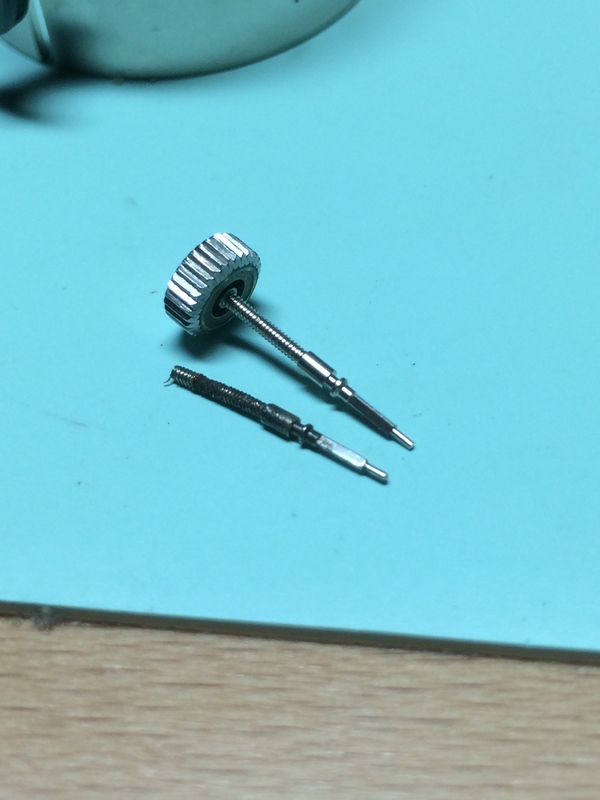 This assembly is typical of Lemania calibers, but doesn’t make it any easier. Once that was done I got the rest of the movement back together fairly quickly, but then noticed another problem. The canon pinion had lost all friction. 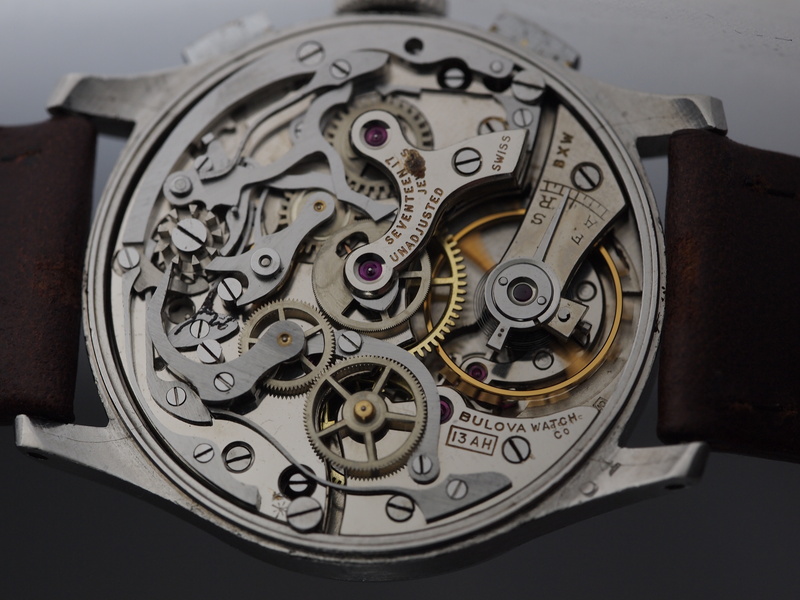 A quick adjustment to that, and the movement and hands were running well together. All back together it is a fantastically rare and great looking vintage piece. 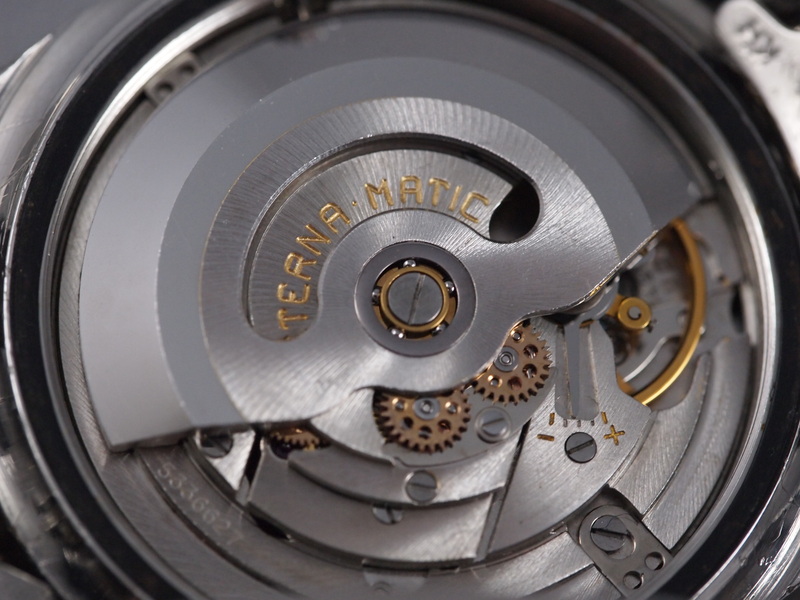 I was happy to be able to work on it and learn the mechanics of the Lemania 134x family. It is also a warning I give often which is to know what you buy, know who you are buying from, and know the history. 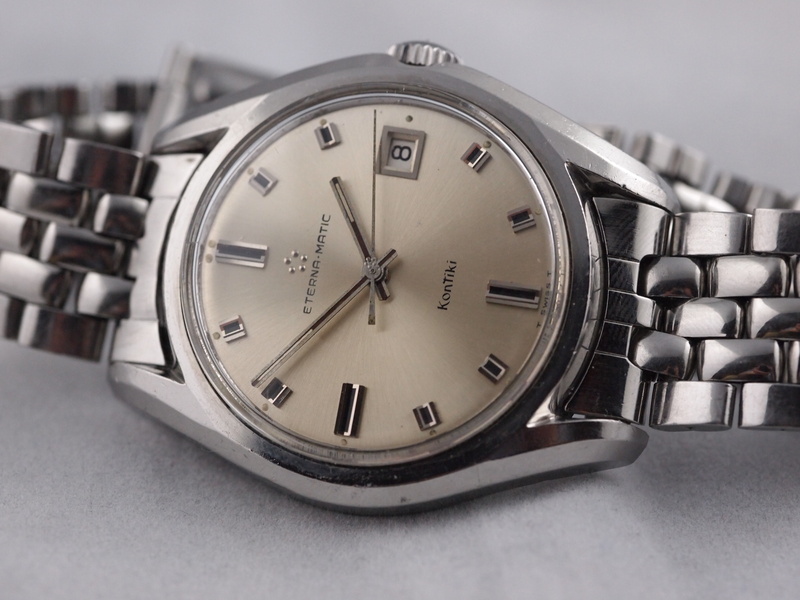 When you buy a vintage piece, know you are getting its history (good or bad) along with it. Watch shows can feel a bit like a meat market. Everything you are told is rare, precious, etc. somehow appears under one roof. Watches are traded, bought, and sold for business. There is no marketing or sentimentality. For many the experience can be intimidating and disenchanting. Admittedly, even after attending several of them, I am still the former. What I love about the shows is the ability to experience so many different watches without all the pretention, a pushy salesperson, or a PR guy with white gloves telling you what’s so special about a particular watch. Usually I spend the first hour or so meandering around trying to find some pieces to work on and write about. After that I park my self behind the booth of one of the most trusted and prominent dealers in the vintage world where I know I will get to see some of the most interesting pieces coming and going. Matthew Bain has spent decades building one of the most solid reputations in the business. He is unquestionably one of the most knowledgeable individuals on vintage pieces, but most importantly (for me at least) he has a true passion for what he does from six and seven figure Pateks to the four figure wacky pieces from the 70s. He can appreciate a watch regardless of the price. The best metaphor I can think of is he is like an exotic car dealer who is also smitten by a Wood-Paneled Wagoneer. More important than any of that is that he is a nice guy who is willing to share his knowledge. A very close childhood friend of mine is his right-hand man Morgan (which probably has a lot to do with why Matt puts up my loitering and endless questions), which is how I got introduced to Matt’s operation and the watch shows. Now that I have set the scene at some length, its time to get to the watch I fell in love with. While talking to my friend another dealer handed him a non-descript clear plastic envelope. Inside it there were two watches. One instantly caught my eye so I asked if I could pull it out and take a closer look. 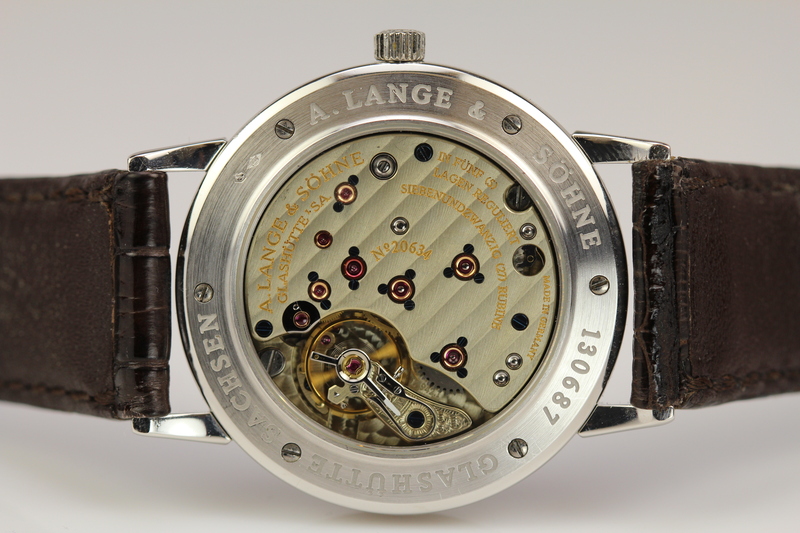 It turned out to be a classic A. Lange & Sohne 1815 with an up/down wind indicator. 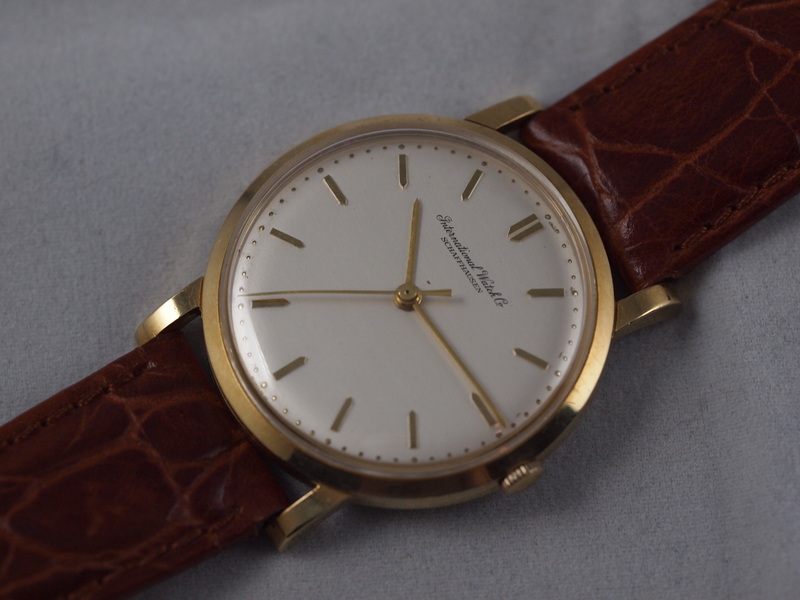 It is such a clean simple and perfectly executed watch. 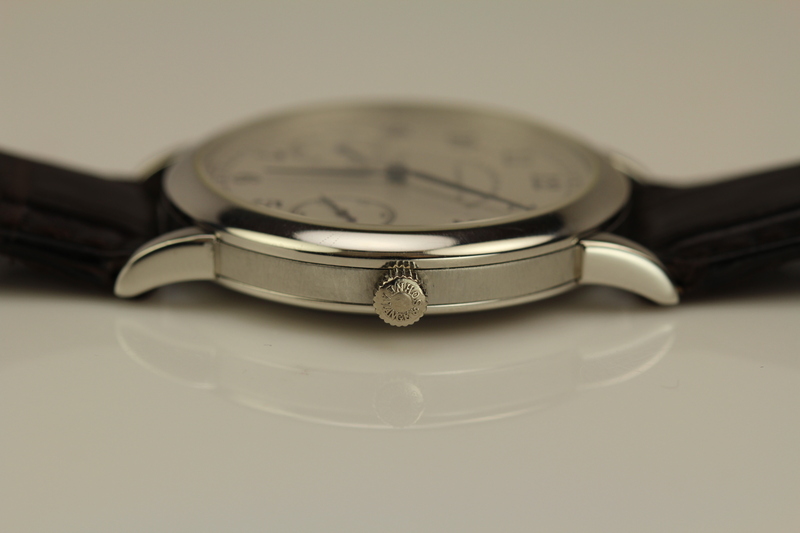 The dial side contains two sub-dials; one for the seconds at 4 and one for the power reserve at 8. As a big fan of tasteful standard bucking, I love the placement of the sub-second dial. 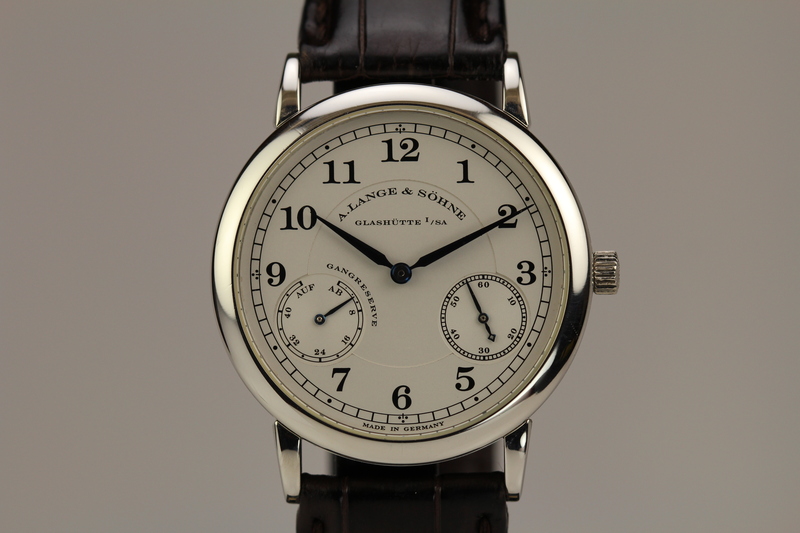 The two-tiered dial is beautiful and reminiscent of old top grade pocket watches. The hands for me are perfection. They are so dead simple and classic. Their incredibly narrow sharp points give an ever so subtle air of precision. The different hands on the sub-dials are also a great touch. Finally and most importantly is how the watch fits. Like everything else on the watch it just seems to fit perfectly. I was really sad to have to take it off and hand it back. It sits on the wrist like it belongs. 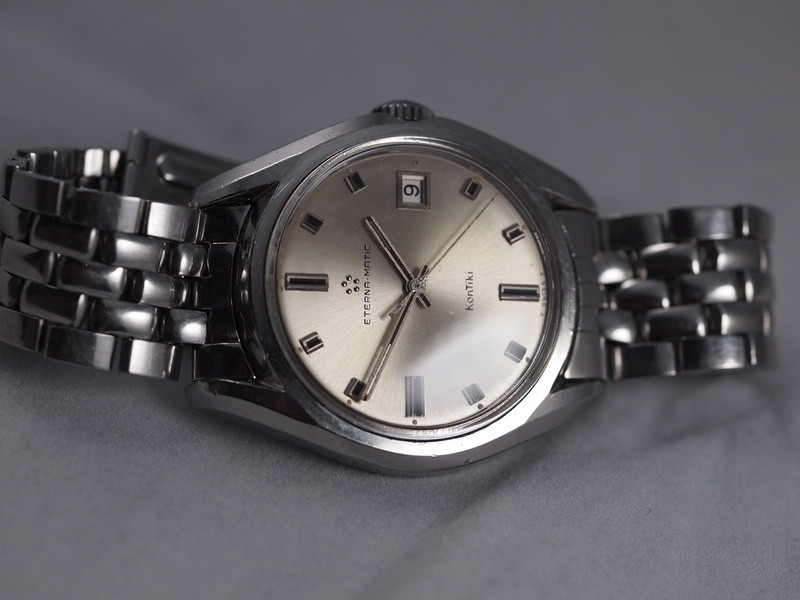 At 36mm it is small by most standards, but its just right on the wrist. The Platinum gives it just enough heft to let you know something special is there, but it’s for you to know and appreciate, not for everyone else. After my experience with this watch I can definitely say one will be in my collection one day. In the meantime, I will return to the pictures on this post, and remember the time I became enamored with the 1815. I can only hope that this piece goes to an owner who will appreciate its beauty the way I did when I had the opportunity to handle it.